Southern Californians—you have only this week-end to behold another amazing Cirque du Soleil show right in our own backyard! So please rush right out to see Corteo, at the Fabulous Forum, one of my original favorite venues in LA! First, a thought on Cirque du Soleil in general. I remember the excitement when they first arrived in town a few decades ago. If you missed their magnificence back then, you were definitely not in with the in crowd. I still feel that thrill every time I even see their name! So I was especially excited to discover that they’re back in LA with yet another offering that’s new to us. 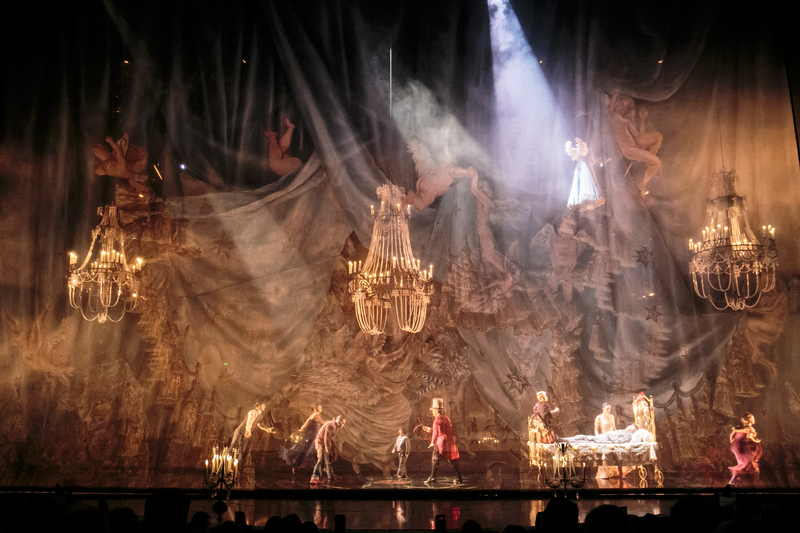 The opening of Corteo. Photo courtesy of Cirque du Soleil, as is the one at the top of the page. 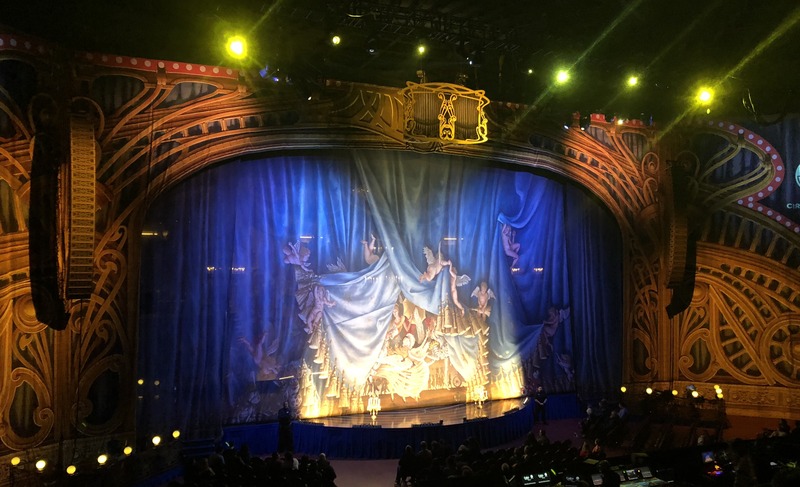 As usual with Cirque productions, Corteo has a story. The official word is that, since “corteo” is Italian for “cortege,” (which is a funeral procession,) it’s about a “clown who pictures his own funeral taking place in a carnival atmosphere.” Although a cortege is usually a solemn affair, you know that’s far from the case here! 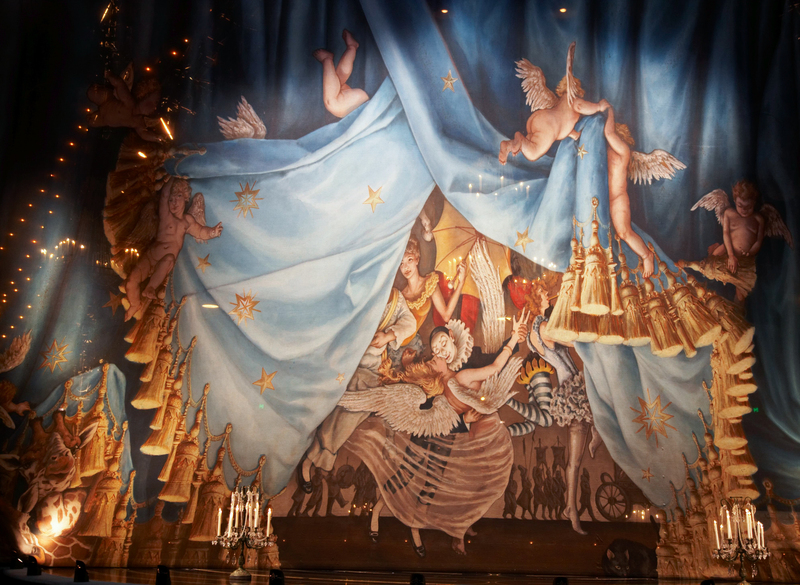 Corteo is actually one of Cirque’s classiest, most innovative productions. After their zillion different presentations, these ridiculously creative minds still come up with acts we’ve never seen before. 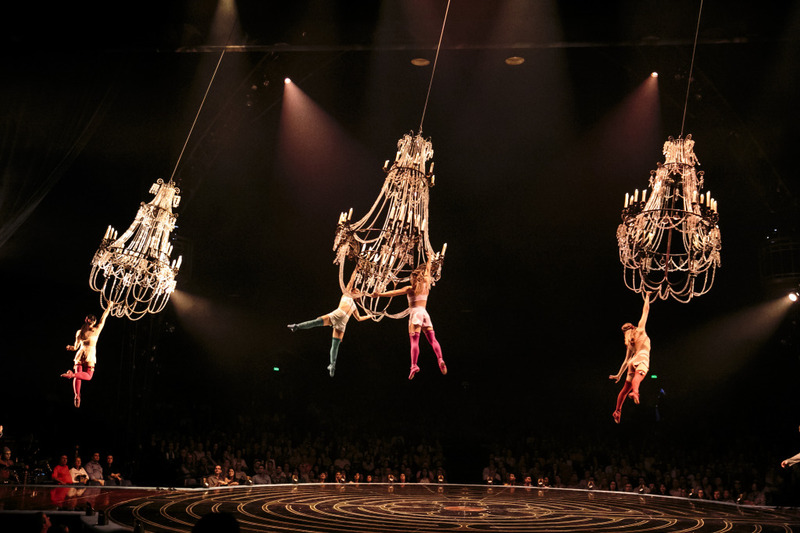 For example, this one opens with a quartet of females doing aerials…on chandeliers! Who dreams-up this stuff??? Photo courtesy of Cirque du Soleil. Every single one of these acts is ultra-creative, with lots of surprises and many magical moments. More on the actual show in a minute, but I must tell you that the evening began with a funny mystery. When we entered the Forum, we checked-out our seats before we headed back to the lobby for snacks. As we entered the arena, the first thing we noticed was the gorgeous stage area. 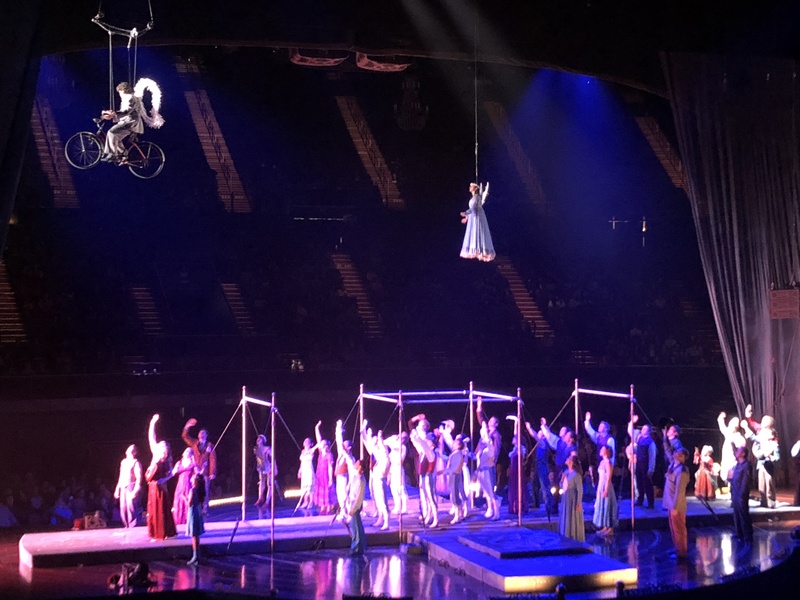 Of the ten or so Cirque productions I’ve been lucky enough to enjoy, I had never seen one on just a regular stage like that, beautiful as it is, so I was sort-of surprised by the new configuration. Then, since it was still early, and lovely out, we walked around the outside perimeter of the Forum, and came to the lobby again pretty quickly. We could not imagine how we had gotten around the entire circumference that fast! When we tried to go to our seats, the section number had changed! The usher told us that our section was actually around the other side of the building. But the stage was right there, in front of our eyes, as it was when we first looked at it. We were so confused. But we walked around the outside again, and came to our section. Mr. X asked what had just happened. I said that maybe we had been upstairs somehow, because the view of the stage had been the same. And then, when the curtain opened, our jaws dropped—it turned-out to be a round stage, with an exact mirror image of seats right across the way! That’s why it had looked the same from the other side of the building! That’s brilliant staging. The stage, as it is before the show. Photo by Karen Salkin. And while we’re on the topic of that venue surprise, I have to tell you what an easy experience this was. I had been to the Forum only once since the glory days of all the sports teams and ice shows. I had actually never even entered the building by the the normal entrance—I was always a regular guest in the Forum Club, so I went in through there. (I know—spoiled much?!) But getting there this time, parking, going through security into the Forum, walking around the lobby—it was all very uncomplicated. And fun, too; they have free digital photo machines in the lobbies, and even a discount on all the concessions when you use a Chase card! So I was pleasantly surprised by the entire adventure this time. And I hope to be back there soon. Now back to the highlights of Corteo. There’s a fascinating number that involves basically just whistling and playing the rims of water glasses and giant bowls. Who would have thought that whistling could be so entertaining?! I guarantee you that only Cirque du Soleil would think of that! The trampoline act. Photo courtesy of Cirque du Soleil. 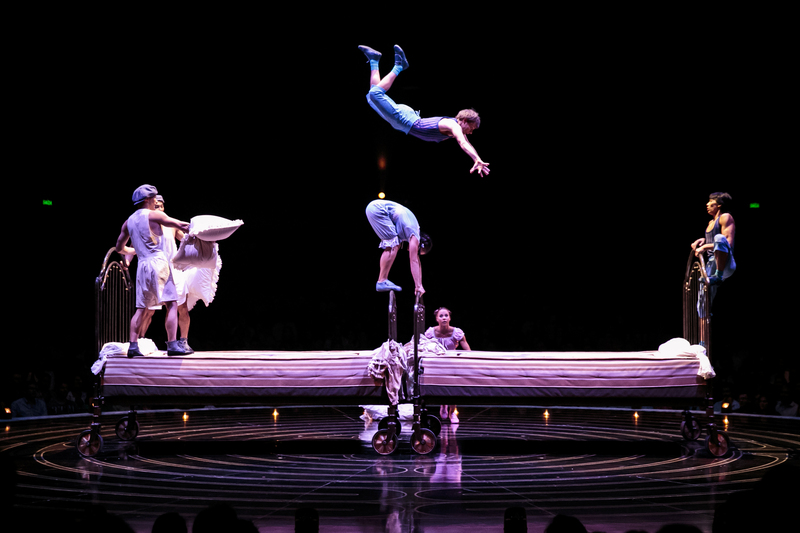 I don’t want to ruin any of Corteo for you by telling you about each act in specific, so suffice it to say that it’s all fascinating, from a trampoline act…on beds, to comedy, to normal circus acts performed in extraordinary ways. And it’s all closed-out in a big way, with high-bar gymnasts, who at times reminded me of foosball men! And we were both bowled-over by Geert Chatrou, who is the talented artist who graced us with the aforementioned whistling! I could not believe that such stunning music can be created that way. 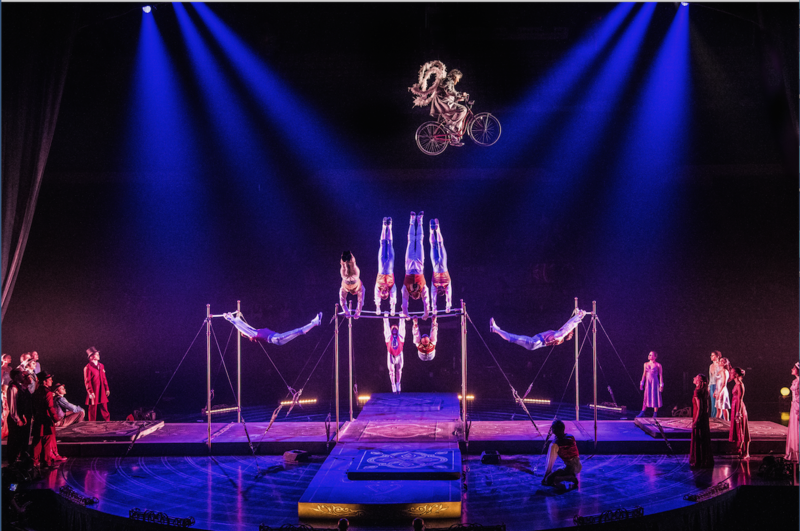 Those three musical artists, from Canada, France, and the Netherlands, respectively, are representative of one aspect of all Cirque du Soleil presentations that I really appreciate–how international the cast is. 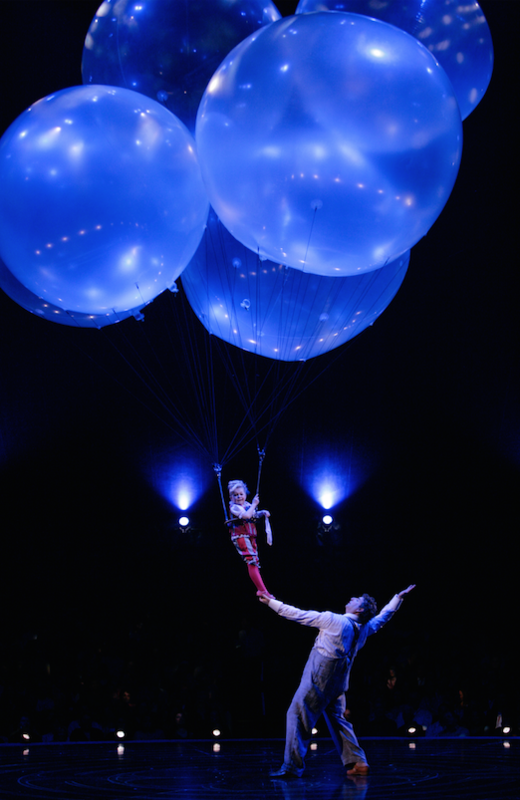 And that reminds me—when it leaves LA, Corteo will be traveling around not only North America, but the world! So even if you’re not in SoCal right now, don’t despair. Just check-out their website below, and find-out when it’s coming to your city. The end of the show. Photo by Karen Salkin. And for lucky Angelenos, I understand that next month, Cirque will be bringing us yet another offering under the blue-and-yellow Grand Chapiteau on the waterfront! So get ready for that one, as well. You know that I am!